1. Nita and Nick have different antagonists (Nita owns the main plot and Nick gets the subplot). 2. I needed a Conflict Box to figure them out. The lovely thing about the conflict box is that it’s simple. If my conflict doesn’t fit in that box, I haven’t thought it through, so to make a box, I have to think of my conflict in the starkest terms: What do they want, and how are they crossing each other? Nita’s turned out to be pretty simple: Somebody’s killing demons and she’s going to stop them, and that makes the demon killer include her as a target to stop her from interfering. Nita can’t stop going after the killer, it’s her job and her job is her life, and the killer can’t stop killing and trying to kill Nita. Nice simple conflict lock. Nick’s is trickier. It obviously has to be somebody who wants to be the next Devil, or somebody who wants Nick impeached or deposed so he or she could be the next Devil now. The problem was, the struggle’s taking place on the island which seemed odd. Why not fight him in Hell? But then I realized that was a smart move. Take him out of the place where he’s the most powerful and then subvert and destroy him while he’s out of his element. So then B’s only problem is how to get him to the island, and that’s where the hellgate comes in: B reports an illegal hellgate and then takes out the first two demons that Nick sends to deal with it, knowing that as a responsible administrator, he’ll come himself the third time. That gives me two different struggles which is not good because I want a unified book. But if Nick’s antagonist B joins forces with A, that solves that. Then the problem is, Why? Why would an insurgent candidate for Devil join forces with a demon assassin? (I know: They fight crime!) They’d have to have a mutual agreement. I can see why antagonist A would do it: if B would promise to remove the demons from the island once in power, that would be a good partnership. But what good is A to B? That is, how does a demon assassin help a Devil usurper? Gotta be the assassination, right? That’s a little weak, so I’m cogitating. Ooh, so cool to see this tool in action! I think everybody in the running for the job, which won’t be open for another 1500 earth years, is qualified. That’s sort of like asking if a person running for President pulls dirty tricks . . . they kind of all do. The dumb thing is that Nick appoints the next one, so they should all be sucking up to him, but they can’t bring themselves to do it because he’s human and they’re all traditionalists. Oh, goody. My very own Conflict Box, and with a model. Whenever you write about the conflict box and its uses, my mind goes to the sweat box. 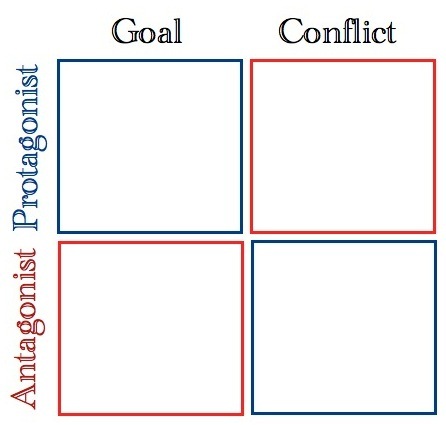 Perhaps because it feels to me as though goal and conflict have to be SWEATED out of my characters before those boxes can be filled in. But now I have learned another term, filled with more comfort: COGITATE. Thank you. Can “B” use Demon Island as a base of operations just because? I mean, to simply be facetious? As an application of humor? The hell gates are there, the island name speaks for itself and maybe he/she is also a droll smart aleck? The problem is that when Nita and Nick start fighting back, the antagonist can just go elsewhere unless there’s a compelling reason to be there. Whatever the reason, it has to be so compelling that the antagonist can’t give up and go elsewhere. Some sort of dirt on Nick hidden there? Or dirt on his other enemies? Maybe it started as a place he and the cronies could go to plot, given the time and dimensional difference, and turned into a hiding place. Nick’s been dead for so long that all the dirt is back in Renaissance Italy, and he was pretty straightforward then. Now that he’s on the island, though . . .
It’s not an election, so there’s nobody running. The job is by appointment only, and he makes the appointment. So their only hope is to impeach him in some way, try to get God to remove him early and put one of them in. Except Nick’s doing everything right. So they’re plotting. And it actually makes sense to go to Demon Island on earth to plot against the Devil because talking about it in Hell would be too risky. I think that’s why Mammon got the bright idea of Demon Island in the first place. And then he looked at the logistics and thought again. He can’t close the gate immediately because the problem is much, much better than he realized. And because he can’t find it. Regarding the reason for A helping B and B helping A.
I think I’m going to put twins in all my books from now on. It solves so many problems. Are they Chinese twins? Who possible work as a butler? Of course, currently they would be referred to as a houseman. Thanks for the reminder. I’d totally forgotten the conflict box. I’ve just started a new story and only three chapters in. There was a niggling sense that there wasn’t a strong enough antagonist. Guess today I’ll be heading to the drawing board. 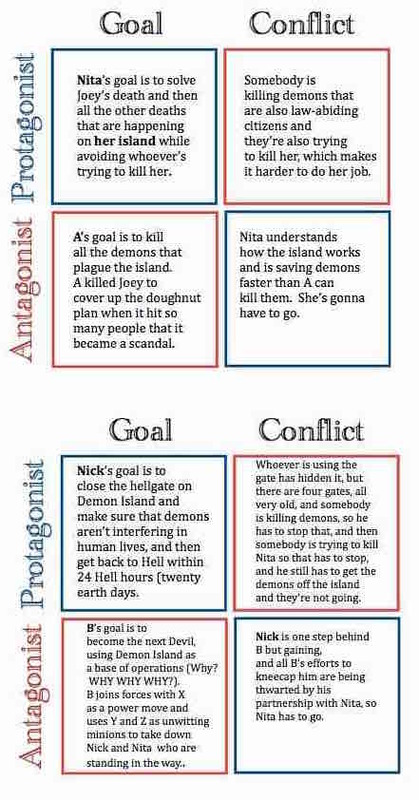 Could antagonists A and B work together only up to a point, at which one double-crosses the other and either eliminates them or attempts to eliminate them (and maybe Nick or Nita then stumble upon them and either ‘turn’ them into allies or realize who the Baddie really is? Those dastardly antagonists are always making promises that mean nothing, or alliances that were not meant to hold up…anything really to gain the assistance of someone who is in a position to further their own goals…be useful…until they have outlived their usefulness. Heavy thoughts so early in the morning…going for another cup of coffee and some funny cat videos or something! You can’t have dastardly antagonists that do dumb things or your conflict has no weight. The antagonist has to be smarter, stronger, and faster than your protagonist, or the fight’s not worth the paper it’s printed on. It has to be the island, because that is where the McGuffin is, which is what they need to help banish Nick from his position as Devil. And of course A and B have to pair up. How else will A get what they needs from B to live a happy life? If it were my story, information of whatever would be hidden somewhere on the island that tells B how another Devil had been overthrown..or that proves Nick is unworthy of his post. A would need someone released from Hell, and she will kill every demon she finds until one of them tells her how to make it happen. And of course it has to be a woman, because..hell hath no fury, right? And that’s your story (g). There is no Macguffin. There is no one thing they’re looking for. I have nothing against macguffins, I use them all the time, there just isn’t one in this story.